Cleans vinyl, covers, cushions, and other marine surfaces. Eliminates mildew without bleaching or staining the surface. Easy to use formula, spray, agitate, rinse. 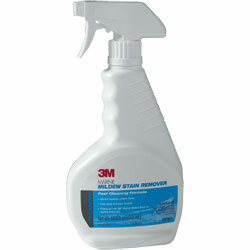 3M Marine Mildew Stain Remover quickly removes mildew stains on vinyl, covers, cushions and other marine surfaces. The penetrating cleaner removes embedded mildew stains to restore a clean, new look to your boat. It works well on light colored and white vinyl to remove dark mildew stains and soil. The spray-and-wipe formula works quickly and requires little, if any, scrubbing. If you have a boat, you need 3M Marine Mildew Stain Remover. Boats are prone to mildew but 3M Marine Mildew Stain Remover makes it easy to maintain a clean, mildew-free boat. Follow-up with 3M� Marine Mildew Block for long-lasting protection and to help keep surfaces looking cleaner and newer, longer.